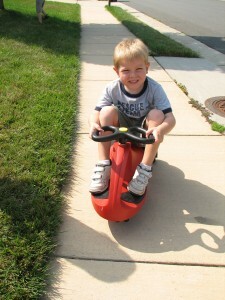 Review of PlasmaCar Ride-on Toy — on NEW review site! I have always loved sharing my opinions of products with friends — and now that I have a blog, I can not only share those opinions with you, I can also sometimes provide feedback to the companies who make the products. BlogHer is an organization for women who blog (well, that’s the simple explanation) and I respect what they have to say, and they have recommended that reviews be kept separate from other content, so I have launched a separate site, Caffeinated Reviews, so I can bring you “Honest reviews with PEP!” in addition to what I write here. I am thrilled that my inaugural review is the PlasmaCar toy because it was a really fun product to review — a toy that both kids and parents can enjoy! So please check out the new blog — blogs are always a work in progress so pardon any cyber-dust as I’ll probably continue to tinker with it for a few weeks — and read the first review and comment! I have more reviews coming and soon, JavaDad and another dad soon to reveal his online identity will be joining me to do some guest reviews from the dad perspective.